Reverend C.T. Vivian was born in Boonville, Missouri and was one of Dr. Martin Luther King Jr.’s closest advisors. 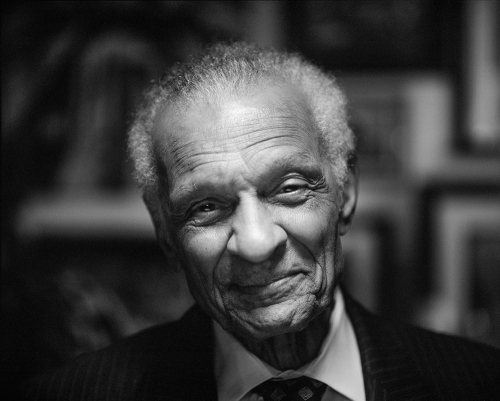 He has spent most of his life committed to nonviolent direct action beginning with one of the earliest and successful non-violent protest sit-ins in Peoria, Illinois in 1947. In 1954 Vivian moved to Nashville to attend the American Baptist Theological Seminary where he became a leader in the Student Nonviolent Coordinating Committee (SNCC). He helped organize the student sit-ins in Nashville and rode on the first bus into Jackson, Mississippi as part of the Freedom Rides. In 1961 Dr. Martin Luther King, Jr. appointed Vivian Director of Affiliates for the Southern Christian Leadership Conference (SCLC) which coordinated activities of branches nationwide including the fight to desegregate Birmingham and organize voter registration in Selma. In 1966 Vivian returned to Chicago and spearheaded organizations to support black children in their education such as the program that would later become Upward Bound. Vivian worked as deputy director for clergy during Jesse Jackson’s presidential run and for the past four decades has lived in Atlanta continuing his spiritual leadership and work on behalf of racial equity. In 2013 President Barack Obama awarded C.T. Vivian the Presidential Medal of Freedom.